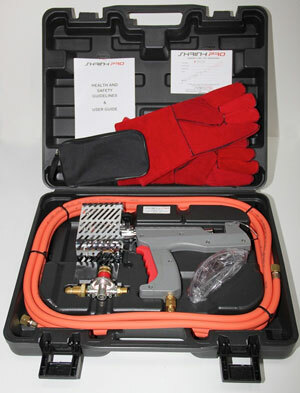 Shrink Pro 10 – the all new British designed heat shrink gun has arrived! We are now stocking the latest Shrink Pro 10 which is cost-effective but still designed with safety and ease of use in mind. We researched equivalent equipment available from Ripack and Shrinkfast that are retailing between £450 and £600. We found that the new Shrink Pro 10 is not only comparable (if not better) in its levels of safety and performance, but we are able to sell it to you for a very cost-effective £300. To find out more or get yours today call our friendly sales team on 0845 643 1601*. Why do you need a shrink gun? Shrink-wrapping guarantees that your products will reach your customers in the best possible condition. The basic principle of shrink-wrapping is quite simple. The item to be wrapped is covered with low-density polythene film and then, on application of heat from the Shrink Pro 10, the film shrinks and tightens to protect the product. With its superior engineering the Shrink Pro 10 has been designed with a wide range of film types, thicknesses and applications in mind. The advanced aerodynamics of the Shrink Pro 10 give a wide and even disbursement of heat which means faster shrink rates and a constant transfer of heat, minimising hot spots. Even though our Shrink Pro 10 heat shrink gun is the lowest priced on the market, it still delivers the quality and durability you would expect. It has a stay-cool guard, ergonomic handle and is safe and easy to use – the flame is never in contact with the nozzle, which stays cool and thus avoids any risk of burning. The flame fans out to cover a large area making the shrink process quick and easy. Shrink Pro 10 shrinks consistently and uniformly, which means that thinner less expensive film can be used. Shrink Pro 10 is completely portable and handheld, with no electrical connections, and weighing only 1.3kg it can easily be carried to any location, any job, inside or out! The system comes supplied with a full one-year warranty covering all parts and labour. Supplied in its own foam lined carrying case, complete with everything you require in one easy to transport item. 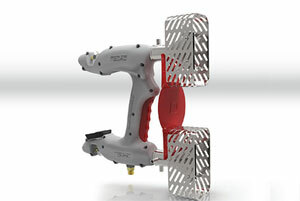 The Shrink Pro Dual will also be in stock from September. 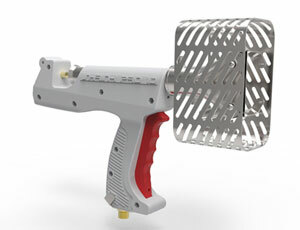 The Shrink Pro Dual heat shrink gun, as its name suggests, is a twin headed model with a competition beating output of 80KW (272,960 BTU/hr) specifically designed for large area applications such as Boats, Buildings, Packaging etc.